I sold a stock photo on Twenty20 for $2. I take tons of pictures on my iPhone so for fun this summer, I uploaded a bunch of my nature shots (you need releases if you put photos of people online)… and proceeded to forget entirely that I did this. As you see, this isn’t the most stunning photo ever taken. But someone still bought it, even after I’d forgotten it was for sale. I told people to sell their extra jewlery on Worthy.com. One of my friends got divorced several years ago. To give her a hand, I offered to shop it around to local jewelry shops. They all offered me less than $100 (I had the original paperwork for the $2000+ ring) so I held onto it. Then I saw Worthy.com and decided I had nothing to lose so I sent her ring in… And got her $600 for it. Since then, I’ve told a few other people to do this (via an affiliate link) and have made $50. Note: they did not accept my engagement ring because it was too common of a style so I ended up going through a local jewelry store. In other words, look online and real life if you are trying to find the best price for your jewelry. I wrote reviews on Capterra.com. You know, as much as I’d love to write reviews all day for free for giant corporations, I don’t typically. But if someone’s willing to pay $10 for my opinion on Quickbooks or Dropbox or whatever, I’m fine writing up a detailed review of my years of experience with it. Occasionally Capterra offers $10/review for up to 5 reviews. So I wrote 5 reviews and got $50 in Amazon gift cards. Think about it, Capterra owns my review and can use the content in marketing or for resale on their site so I don’t feel bad getting money in exchange for adding to their database of information. Note: if you are a small business that I have a good experience with, I’m happy to leave a review gratis. I am an Airbnb Superhost. We could say I didn’t choose the Airbnb life, it chose me. I will say having people constantly in your living space can be a little draining (insert high strung dog and demanding day jobs for additional consideration) but it has been a good way to help pay my rent and generate some additional income for my landlord and myself. If you find yourself in Bar Harbor this summer and want to check out the Golden Girl Palace (long story) for yourself, come on over. 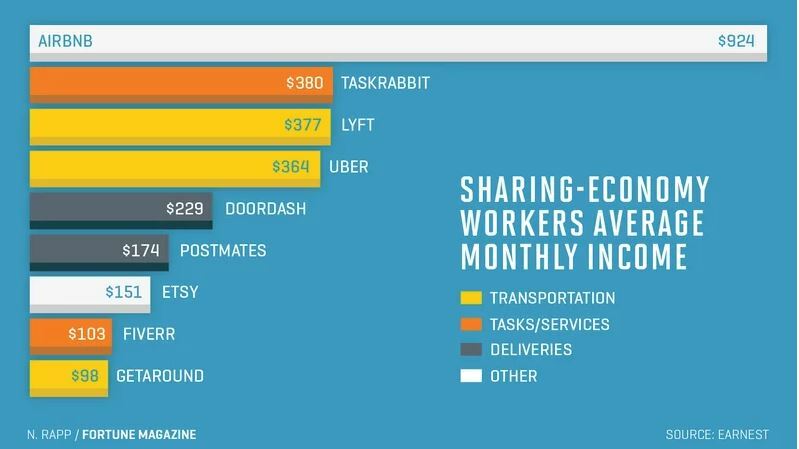 Airbnb is the largest paying part of the sharing economy. Click here to learn more. I rent out my projector/screen setup. My budget for starting Breaking Even was about $10,000. I used $1000 of this to buy a nice LCD projector and screen setup. I was doing a lot of presentations and was getting tired of relying on the venue’s technology. Then I met other people who needed stuff (most of what we rent this out for is family reunions and weddings with an occasional business presentation and kid’s birthday party). We rent it out for $50/day which includes any needed dongles/Mac converters, extension cords, table to set it on, etc. I estimate we rent it 3-5 times a year so we’ve more than paid back the initial investment, plus it’s a benefit we can offer our coworking space members. I hosted an amateur comedy night. I’ve been wanting to try standup comedy for awhile so I made a plan to really do it. When I realized I had to travel 4 hours and miss two work days to do it, I figured I had to host something local first to see if I liked it. So I contacted a local venue and asked if they’d be up for it. We could charge a small cover, which would cover my time to organize and run the thing (and my help with marketing) and they could sell food and drink. So I made a Facebook event and talked about it a little online and then showed up that night and ran the event for two hours. It went great and I walked away with $300 in covers. I guess the moral is, if you want to do something, see if you can find a way to do it in a low risk way and partner with a venue that has a complimentary audience. I made and sold courses on Teachable. You too can buy my SEO course or my online shopping card course! Basically, if you are a consultant type (or heck, any industry where people have to like you to do business with you) an online course is a low risk way for prospective clients to try you out. Plus if you naturally like public speaking (see amateur comedy night), it’s not that much of a stretch. I will, however, be moving these courses to my own domain to avoid the monthly fee, now that I know people are theoretically interested in them. I’m not including my ‘passive’ income experiments here. There is a learning curve, during which you clearly aren’t earning money. It’s not any money I can count on (at least for now) because it’s so variable. For example, I might sell 10 SEO courses one month and 0 the next month. Most things start online but have an offline component to be truly successful. If you want to sit in your basement and not talk to anyone and be completely anonymous, the reality is very few online opportunities will exist for you. Now I could do more to expand these. For example, I keep meaning to email all the local caterers and other event venues about our technology setup so they could upsell/rent it for their events. I could get multiple peoples’ jewelry and shop it around for them. In other words, any of these things could bring in more money if I let them… but since most of them happened by accident, I am only thinking of these ideas now. In other words, as long as you treat online income as a fun experiment that may or may not make you money, you’ll be able to do these (or others) with a spirit of fun and excitement (versus desperation and drudgery). You might not be able to quit your day job, but at least you can get random emails in the middle of the day that will notify you that you made a couple unexpected dollars while you were doing other things. 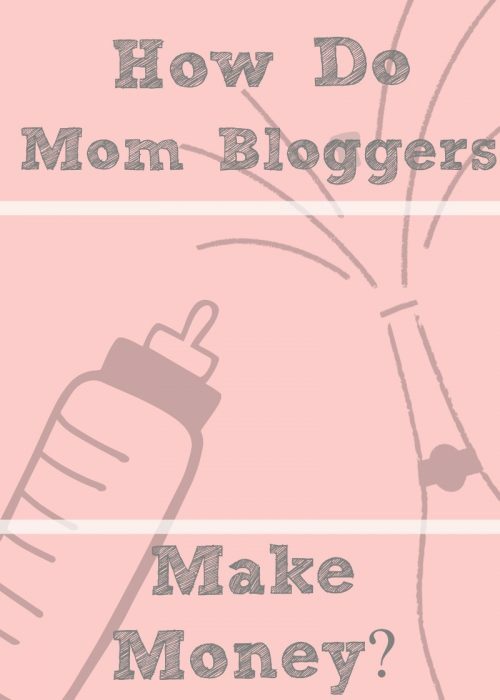 How Do Mom Bloggers Make Money? Until recently, I was under the impression that most moms who blogged did it just to hear themselves talk. But now that I have my own personal blog and will soon be a mother, I’m realizing that isn’t the case at all. Most mom bloggers are actually making money with their blog. Plus, it allows them to stay at home most of the time, do something they enjoy, and raise their kids. I definitely see the benefits. These women may also be looking to make some money during maternity leave, which is not always paid for in the U.S. (I just read an interesting article about women who are using crowdfunding to allow them to go on maternity leave without worrying about money). Ads. Back in the day of mom-blog Dooce, bloggers made a good chunk of money using banner ads. This article explains why that became basically extinct as a money making option, thanks to the rise of mobile. Today, tools such as Google AdSense, BlogHer, and Media.net work as middlemen, connecting you to companies looking to advertise. The flipside, especially when using tools like Google Adsense, is that you’re at the mercy of how they decide to set up the advertising. For example, Google Adsense just gives you a code to copy and paste into your website’s header. You don’t have any customization options (or any control over whether Google decides to display any ads at all). Want to learn more about the different types of online ads in detail? Check out our Online Ads 101 blog post series! Sponsored Posts. Sponsored posts have become popular in recent years with mom bloggers looking to generate income. The posts usually are formulated after a larger brand connects with a blogger to create some sort of offer, in exchange for product/service promotion. A lot of these brands also have programs that bloggers and others can apply to participate. Most sponsored post bloggers are paid to write the post (which may have to meet certain rules/guidelines), no matter how many sales are generated afterward. Many bloggers will disclose to readers at the beginning of the blog post if it is sponsored (some consider this a matter of ethics). This article explains that a sponsored post’s primary goal is brand awareness; actual sales are secondary. Aforementioned mom blogger from Dooce discusses her personal reasons for not going the sponsorship route: “The problem is I have to give my readers what they want, I have to give the brand what they want, and I have to be authentic to who I am.” Pleasing everyone in this instance can be tricky, and it makes sense that this model is not for everyone. Affiliates. Affiliate programs’ monetary arrangements differ from sponsored posts. The blogger is usually given a specific link or code for their readers, and if someone makes a purchase within a certain timeframe (often 7-28 days), the blogger gets a certain percent of the sale. This might be more mutually beneficial because payment only occurs when a purchase is made. The blogger may also have a bit more freedom when it comes to sharing the affiliate link. As with a sponsored post, the writer could create one or more posts dedicated to the affiliate brand, sharing the unique offer at the end of the post. If that feels uncomfortable, they could also create a widget/button on their website that links to the affiliate. Another idea for multiple affiliates is to create a landing page of all affiliate websites (which more or less just shoves them all in the same area). As long as the blogger is within the guidelines of the affiliate program, there can be more wiggle room in how it’s marketed. Another idea for multiple affiliates is to create a landing page of all affiliate websites (which more or less just shoves them all in the same area). As long as the blogger is within the guidelines of the affiliate program, there can be more wiggle room in how it’s marketed. Creating a Product/Service. This involves a more active approach to generating income, meaning there has to be some product or service offered to readers. In order to make it profitable, the readers, in turn, have to perceive the product as something valuable. In this Penny Hoarder article, mom blogger Suzi Whitford discusses how she gave up her engineering job to be a stay at home mom, but still wanted to contribute in order to offset household expenses. So she started her version of a lifestyle blog, but with a spin (honestly, I think this could easily be an episode of Side Hustle School). She first created an ebook to help people start their own blogs, and later created online courses. People could purchase these on her website. There are plenty of options for mom or other lifestyle bloggers when it comes to making money. Part of the decision-making process is knowing what type of experience you want to provide readers (i.e. if you want them to experience an ad-free website), and being clear about your mission. Stay tuned for more posts about mom blogs and bloggers coming this month! Looking through your contact form inquiries, social media comments, and email inbox, I’m sure there are some things that people are asking you for that you are unable or unwilling to do. You can create a more formal relationship with a complimentary business in the way of an affiliate relationship, partnership, or joining a referral networking group like BNI. No matter how formal or informal, working with complimentary businesses means you can steer your customer (or potential customer) in a good direction so they still feel taken care of by you and hopefully, that other company appreciates and reciprocates, either with a portion of the sale you generate or by sending referrals your way, too. Let’s say you sell something that goes well with other somethings… but you don’t necessarily want (or need) to carry it in your retail shop. Consider making a subscription box, where customers subscribe for a monthly price (or slightly lower quarterly/annual) price to get a box of stuff around a theme. An excellent example of this is Willie Wags right out of Bangor Maine. They send out boxes of stuff collected from different businesses celebrating women entrepreneurs (they’ve recently moved to a retail location in downtown Bangor too but they could have kept it subscription box only if they wanted I’m sure). Events take a lot of bandwidth but they are good ways to attract new customers whether it’s an open house, a workshop, or something else. Finding a complimentary business to help you host an event is a great way to not only divide the work but make the event more fun. For example, if you are a hardware store but you don’t do party rentals, it may be cool to have a cookout/block party with sales going on while you have a few rental pieces of equipment (bouncy houses and slush machines anyone) set up too. There’s also a likelihood of more attendees because you get the draw of two (or more) businesses- customers of one business may show up and decide to become customers of the other business, too (especially if there’s a bouncy house involved). 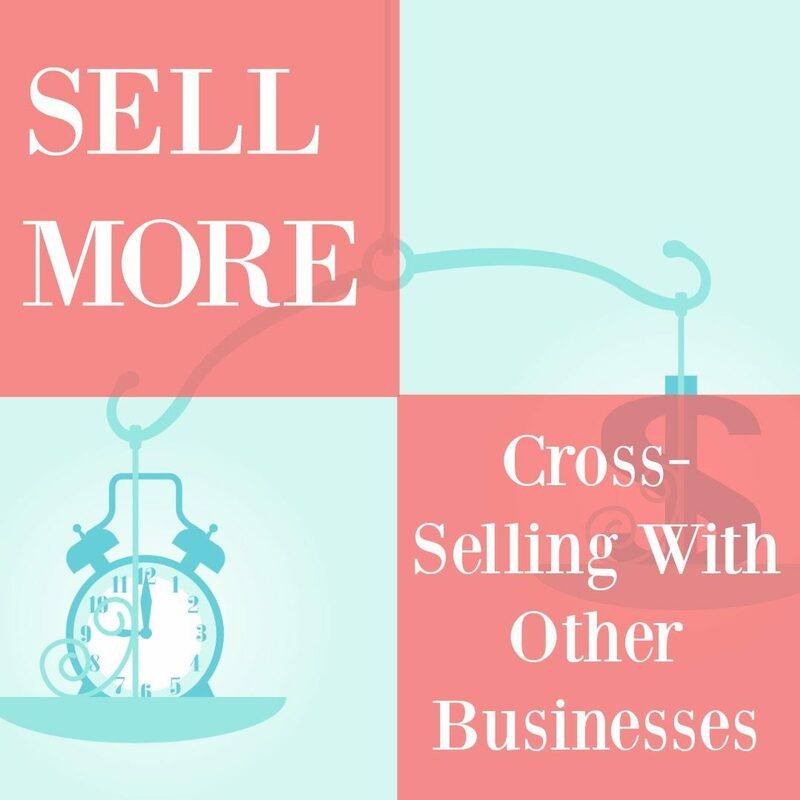 In other words, cross selling doesn’t just have to be your stuff. It actually works well when it isn’t. By figuring out ways to work with other entrepreneurs in a complimentary space, you can all win together. This month’s theme is showing love to businesses and, much like we’ve formalized love with marriage, the formalization of business love online can be an affiliate agreement. An affiliate is someone who reps/represents your company a mutually agreed upon way. They aren’t an employee but they’ve typically signed up to let you know they are interested in doing this. You may have terms for them, like they can’t use the product you are trying to sell in a certain way or can’t do certain things with product links. Once signed up, your affiliate can recommend your company and typically they get a financial kickback for doing so (ex: when someone becomes a paid member or upgrades their account.) In other words, they can recommend all they want but until your company gets a conversion, you don’t owe them anything. 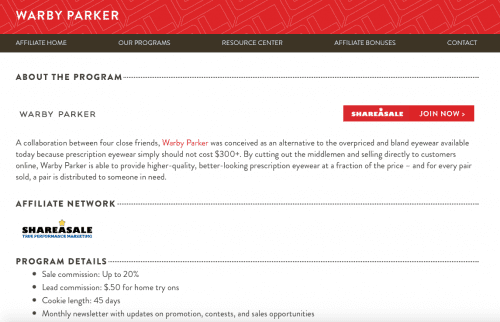 By Googling “Warby Parker affiliate” I see what the terms are for me to recommend cool frames and where I can sign up. This brings down Warby Parker’s overall marketing costs while giving me incentive to share my love of them. How do you know if an affiliate has made a sale for you or not? Option 1: Give them a custom link. For example, let’s say your name is Bob and you LOVE our blog and wanted to get people to subscribe. 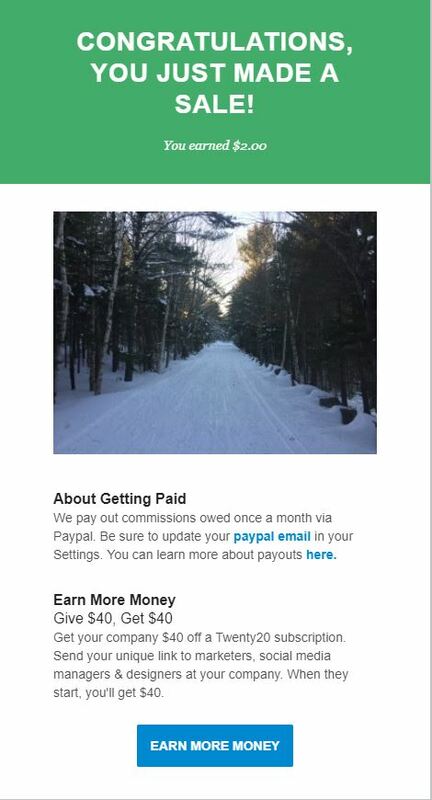 We talk about it and I say I’ll give you $1/person who signs up for email list. I could make a custom email newsletter subscription link like breakingeveninc.com/newsletter%bob that you can share. The people you share that link with are directed to a normal looking page; I’m just tracking it in a special, distinct way. In my website software, I could set up for it to track when someone who got to that link signed up for our email newsletter (filled out and submitted a form successfully). Every month, I sendBob a check for the amount of subscribers he sends. The link makes things easy because the ‘customer’ doesn’t have to do anything. As the affiliate, you have to remember to use your special link and as the company, I have to set up tracking but the person clicking through is mostly unawares. Note: Bob could do something cool with his website like make bobswebsite.com/becrocks redirect to my fancy affiliate link. That gives Bob’s friends/customers something easy to remember and lets him use the affiliate link we agreed upon together. Option 2: Give them a coupon code. The other way to do this, especially if this relationship involves purchasing, is to offer a code. Let’s say as someone entered their email into my website, I have a ‘coupon code’ portion where the person signing up is supposed to write ‘Bob’ for him to get credit for sending me a subscriber. The good thing with this is it’s very deliberate coming from the customer… but most people aren’t going to take the extra step unless they get something for doing it. That’s why most coupon codes involve a discount code or free download or something for the customer for taking the trouble. Maybe by entering ‘Bob’ in the signup form, the people get a free ebook from me. Whether option 1 or 2 is used, both Bob and I understand what is supposed to happen and what Bob will get when that agreed upon thing happens. Anchorspace is an affiliate for StandDesk which means when someone buys from our link, they save $50 and we get $50. So we’ve earned $150 just by recommending a product we already use and love and given people too far afield to come into Anchorspace a way to support us through their purchase. How do you set up an affiliate program? You may think this seems complicated. Why set up something just for Bob? If you think about the power of even having ten people like Bob as sort of un-salaried salespeople for your company, you’ll see that this can be a good idea for you. First of all, you’re only paying when you get what you want and second, by rewarding Bob and people like him, you’re incentivizing him to refer you more often, even if it’s a discount on your own products versus cold hard cash. So you have two options with affiliate programs. Option 1: Use an existing (third party) affiliate program. Websites like shareasale.com or Commission Junction offer a ‘plug and play’ option where you can set up agreements, have it automatically generate/track links, etc., which is perfect if the idea of DIY totally overwhelms you. If what is preventing you from doing this is the tech, please take that away as a concern. That said, Moz has an excellent point as these websites are creating links that aren’t as direct as you making the links yourself, which can detract from search engine benefits. Also these probably cost money since they are attempting to make your life easier. Option 2: DIY on your own website. Tools like Google Goals and plugins like AffiliateWP Wordpress plugin allow you to set this up on your own website directly. So long as you are clear about how you want it to work, it’s totally doable to set up and even have it create cute reports and stuff. If you ask someone like us, we can get you an estimate at the very least and you can make your decision from there. The best thing you can do to understand affiliates better is to try them out yourself as a referrer. To become your own version of Bob, think of companies you already like. Visit their websites (the best first stop is the navigational menu that is typically on the bottom of the page) and look for an ‘Affiliates’ link. If you don’t see one there, ask Google if the company has one, or write to the company via their website and ask. Once you have a few affiliate links/codes, try them out with people you think would genuinely appreciate those goods/services. Are people receptive? Does certain language/certain websites seem to work better for you? Do certain things seem to make people take action? 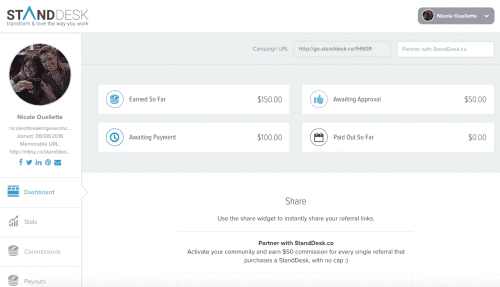 Use these experiences as the referrer when you make your own affiliate program. Like any tool, when used sparingly and in the context of an overall marketing strategy affiliates can be an effective way for people to love your business and get rewarded for it. (Yes we are considering an affiliate program ourselves; contact us if you are interested.) In the meantime, let us know if you are an affiliate yourself or if your company uses affiliates to drive sales! The last few weeks, we’ve talked about a few different ways to make money online with your website: PPC (pay per click) ads, display ads, and ad networks. The idea, of course, is not to overwhelm but show you how some of your favorite people online make money when you visit their website. This post is the last in our series. The most popular online affiliate program is Amazon. When you sign up, they give you a way to make special links to products on Amazon.com. Like the new desk chair you bought? Make an affiliate link. Like the sweet and spicy tea you keep in your office? Make an affiliate link. Then you post these links places: social media, blog, website, email newsletter, etc. If someone follows your link and buys your product, you get 2-3% commission (up to 10% if you sell more). I made $1 as an Amazon Affiliate. Stop being jealous. Amazon doesn’t have high profit margins so they can’t give you, say, 50% commission. But that’s where working directly with a smaller distributor makes sense. The more directly you work with the company selling the product, the higher your commission. Love Rupaul but not sure my love is $199 of love. Point is, affiliates let you recommend stuff and get paid, without having to process the payment, ship it, or really do any kind of customer service. You are middle manning it. That said, if you have an audience and that audience trusts you to recommend products, your middle manning is worth something. Affiliate marketing, when done by those who genuinely enjoy a product and want others to experience its benefits (and, let’s face it, make a buck or two in the process), is a useful marketing tool. That said, there can also be a dark side. For example, if I am a financial advisor and I sell you the IRA plan where I make commission on but there is another IRA in the world that I know is actually better for you, that’s conflict of interest territory to me. I couldn’t sleep at night doing that. But as long as you’re straight-forward about what you make money on, I think affiliates can be perfectly ethical and potentially profitable.